D.M Aderibigbe was born in Lagos, Nigeria in 1989. 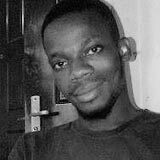 He is an undergraduate of the University of Lagos, studying History and Strategic Studies. His poetry and short fiction have appeared in journals across 11 countries around the world, including Cannon’s Mouth, WordRiot, Red River Review, Ditch among many others.